California does not have a statewide data system that tracks student progress through K-12 and higher education and into the workforce. As a result, educators and policymakers cannot answer critical questions about student progress, which limits their ability to make evidence-based changes to support better and more equitable opportunities for students. The good news is that the state’s education systems already collect the data needed to develop a statewide longitudinal data system (SLDS) and California has several options for creating such a system. These are the key findings of two years of research by the Education Insights Center (EdInsights). California needs an SLDS to understand and improve how students fare from K-12 schools through colleges and universities and into the workforce. What is the best model for linking existing data? The state should develop a centralized data warehouse that can create standard reports and data dashboards for key audiences. Where should the data be housed? California should create a data office within an existing state agency, or create a new state data agency, to manage an SLDS. Does California need a higher education coordinating body to develop an SLDS? Creating an effective SLDS does not require a new higher education coordinating board, although one could be beneficial. California already collects expansive sets of data about students in its public K-12 and higher education systems—data that, collectively, have great potential to meet the information needs of state policymakers, local educators, and students and their families. 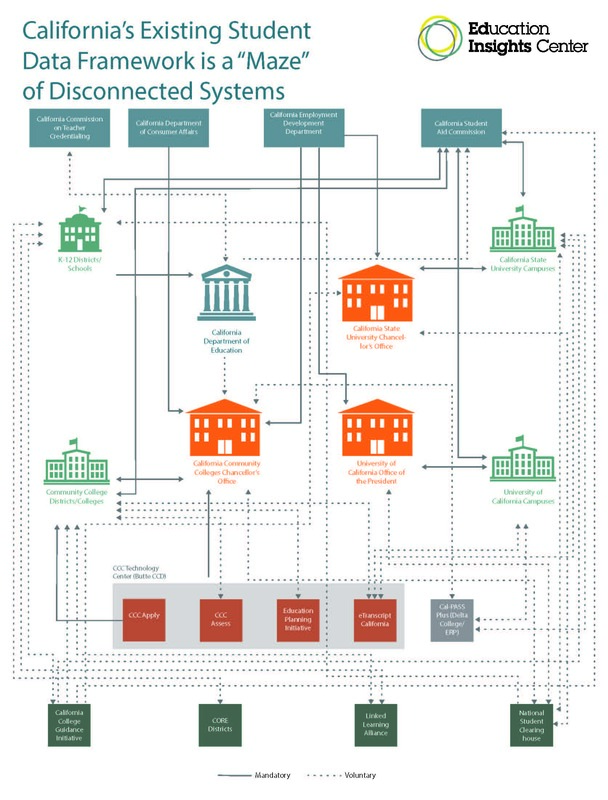 But the data are maintained in systems that are not connected, are subject to different regulations, and often use different data definitions (see report 2). This maze of data makes it difficult or impossible to access, share, and use information about student progress—whether at the state, regional, or local level. Local educators have asked for state leadership in developing a statewide data system. State policy staff are aware of these requests, but express doubt that that an SLDS would provide enough benefits to justify its implementation costs (see report 1). They cite numerous challenges, particularly the need to overcome political and cultural barriers, limited understanding among policy and system leaders about the value and purpose of cross-system student data, and the lack of any organization assigned with cross-system planning. Some state policy staff cited the above challenges when suggesting that data-sharing activity at the regional level is a promising alternative to the development of a statewide student data system (see report 3). But participants in some of these regional efforts suggest that these partnerships often get stalled in the early planning stages, and face the same kinds of challenges as those cited by policy staff at the state level. Considering the large number of school districts and colleges in California, a region-by-region approach is not an efficient or effective solution for tracking the progress and outcomes of the state’s mobile student population. 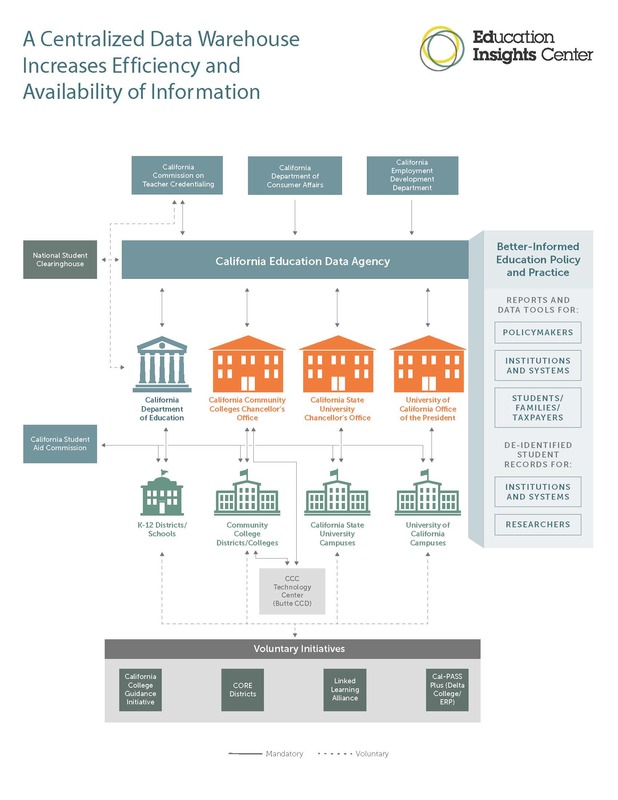 California lags behind many states that have already developed ways to use statewide data systems to provide critical information to policymakers, educators, taxpayers, and students and their families (see report 4). Fortunately, California has a range of options for developing an SLDS; examples in other states illustrate the variety of structures and processes to link and manage student data across education systems. National experts suggest that there is no one best model; rather, the best fit for each state should align with its history, culture, and capacity. They suggest that the annual operating expenses of an SLDS may not be as costly as some assume. California should create a data office within an existing state agency, or create new state data agency, with the mission of developing and managing the data warehouse. California would likely benefit from having a higher education coordinating body, but developing a data system is not contingent on resolving that issue. State policymakers and local educators need access to adequate information to improve equitable student learning, progression, and success. It is time for California to help by developing a vital tool to support their work. This research was made possible through the generous support of the Bill and Melinda Gates Foundation. Report 1: Gaps in Perspective: Who Should Be Responsible for Tracking Student Progress Across Education Institutions? An analysis of the perspectives of state and local leaders on who should be responsible for gathering and sharing data about students’ progress. Report 2: California's Maze of Student Information: Education Data Systems Leave Critical Questions Unanswered. An overview of student-level data collected and maintained in California, a summary of past efforts to develop a more comprehensive system, and an exploration of the strengths and weaknesses of the state’s approach to education data. Report 3: Scaling Goodwill: The Challenges of Implementing Robust Education Data through Regional Partnerships. An analysis of some local and regional efforts to share data across institutions and systems that includes the benefits and challenges of participating in these efforts. Report 4: A Hunger for Information: California’s Options to Meet its Statewide Education Data Needs. An exploration of lessons for California from other states’ efforts to improve their education data systems, and some conclusions concerning a path forward to improve California’s data systems for use in understanding and improving education policy and practice. Summary: Research Findings and Recommendations. A summary of key findings and recommendations from the series, which includes infographics demonstrating the ways that a Statewide Legislative Data System would streamline data sharing among K-12 and higher education segments. Insights Blog: Why the Simplest Cradle-to-Career Data System May be the Best Place to Start. A long awaited window is opening. Governor Gavin Newsom’s first budget proposes $10 million to develop a longitudinal education data system that would “better track student outcomes and increase the alignment of our educational system to the state's workforce needs.” But the people who will decide whether and how to create a statewide data system face some critical choices—namely, what purpose would such a data system serve? Who would use it and which questions would it be designed to answer?